Salaries are not the only thing that’s important for an average employee – things like free gourmet food, napping pods and office salons are equally essential to retaining staff, too. Given today’s talent crunch, companies have to elevate their benefits and incentives in order to attract the best candidates. It’s a way to show your employees that their work is valued and appreciated. In a survey conducted by Reboot Online, it showed that 70% of employees say incentives make a difference to their motivation at work, and job retention. Great employees are the ones who continuously find ways to improve their professional skills. You can support that by offering free training sessions on special topics or even offer to subside their post-graduate studies if they have stayed with your company for a specific number of years. By offering your employees free education, you are supporting their pursuit of further knowledge and excellence, which will definitely enhance their work performance. Not all employees thrive in a nine-to-five office environment. Sometimes, they’re more efficient with flexible time in and time out. You can replace the structured working day with a list of specific tasks they need to accomplish within a set window. Leave it up to your employees to figure out the best way to accomplish their to-do list. Employees will be more inclined to work work better if they feel like they have accomplished something. Having the freedom to work on their daily to-do lists, at their own pace, can help improve their efficiency and boost their morale. Flexible work hours are also beneficial to employees with young families as they can balance their work and personal life better with this kind of setup. According to Sam Decker, CEO of Mass Relevance, their company abides by a principle it calls Freesponsibility, where there are no set work hours. Plus, there’s also unlimited vacation time for every single employee from the day they start. Freesponsibility draws from a psychological and social phenomenon called the Pygmalion Effect that says the more trust you put in someone, the more they will fulfill that trust. Freesponsibility has been a good move for the company, from both a business and a cultural perspective, according to Decker. You can offer equity based on the valuation of the company, which means they earn more from their shares if the company is valued higher. It encourages staff members to work harder on making the company worth more, so they can own a bigger chunk of it. You can offer key employees an ownership percentage of the company, which they can get when someone buys the company or if it goes public. Think about your short-term and long-term plan for your company and implement accordingly. Sometimes, little things like a free organic lunches, gourmet coffee or office gym can make all the difference. People spend a lot of time at work and it helps boost their motivation when they know that the company is looking after their health and well-being. You can host after-work yoga three times a week or offer to subsidize your employees’ membership to the wellness activity they prefer. In the end, what you can afford to offer as incentives has to be valuable both for you and your employee. 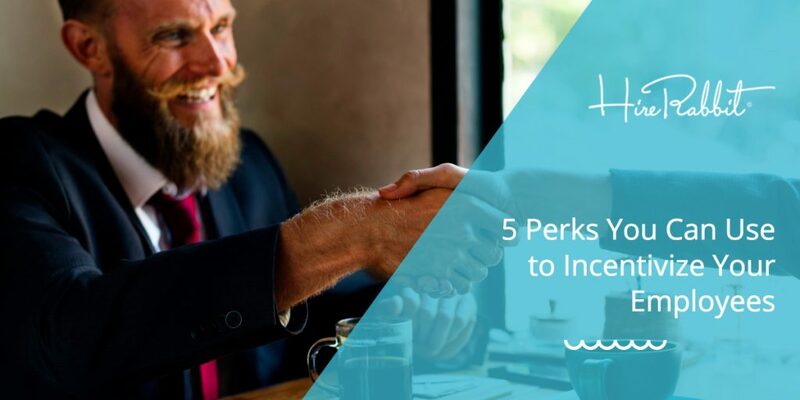 Offering good staff incentives can bring in great benefits in the long run if you continue to offer your employees what they want, and not what you think they want. Do you have other ideas to incentivize employees? Share them in the comments below. Visit HireRabbit for tips on how to use Facebook and mobile career sites to improve your recruitment.